Includes 1 bodypack transmitter & 1 portable receiver...perfect for transmitting audio to one remote speaker. All Wireless Speaker systems are the new G4 (Generation 4) from Sennheiser. Includes 2 bodypack transmitters and 2 portable receivers - perfect for transmitting stereo audio to 2 remote speakers! All Wireless Speaker systems are the new G4 (Generation 4) from Sennheiser. Our most economical system for transmitting audio to 2 remote speakers - Includes 1 bodypack transmitter and 2 portable receivers. All Wireless Speaker systems are the new G4 (Generation 4) from Sennheiser. These are the portable receivers for use with our wireless speaker systems! Includes everything you need to provide your wireless speaker system transmitters or receivers with AC power! When you purchase these items as a kit/bundle from agiprodj, we custom build the parts including modifying the NT2-3, soldering to the DC 2, applying heat shrink tubing, and finishing with a quality control bench test. 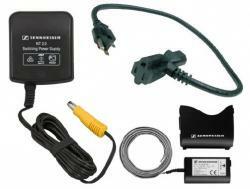 All you have to do is plug it in for quick & easily AC power to your receivers or transmitters! (Order 1 kit per Rx or Tx).